Autostarts helps you keep control over your phone by letting you have a look at what applications do behind your back. It'll tell you which apps automatically run when the phone boots up, and what other system events trigger in the background (e.g. when an SMS is received, certain buttons are pressed, etc). The latest version is 1.9.7, published 2014-12-18. Autostarts is available in Google's official Android Market for a small cost. At this time, a demo version is not available. 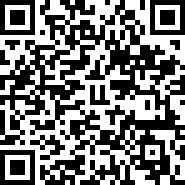 You can use the barcode to jump right to the app in the Market. The source code is available under GPL. If you'd like to translate the app into your own language (or help improve an existing translation), you can do so you can do so on Transifex. Fix state toggle when ADB is disabled. 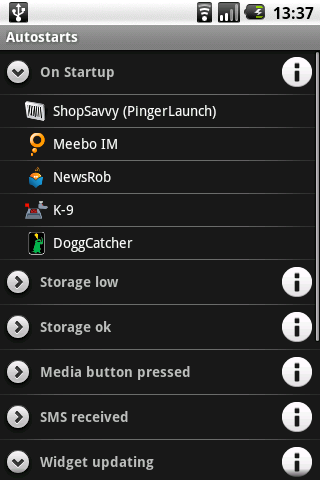 Fix state toggle on <= Android 4.3, broke in last update. Fix root access on CM11. Fix root access on Android 5. Updated to support Android 5. Improve UI: New, high-res icons, toolbar buttons. Fix empty list issue on Xperia devices (thanks to Michał Bednarski). Do not block UI during state change, process in background. I am aware of the issues with Xperia devices. These will be fixed in a follow up release shortly. Only released on Vodaphone AppSelect. Removes root functionality. Only released on Vodaphone AppSelect. Removes the "Find in Market" option. This release mostly fixes ICS/Android 4.0 issues, and drops support for Android 1.5. 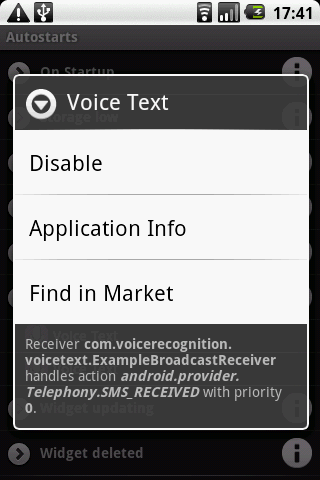 On ICS, the Enabled/Disabled option was sometimes incorrectly labeled. On ICS, state-toggling would generally not work, and show the standard failure message. On ICS, sometimes state-toggling could crash the app. Translation updates, including some new translations, Italian and Polish. Thanks to LucaTrev and Adammo, respectively, for their extensive work on this. Only released on Amazon Appstore. Introduces a separate build series that contains a "Find in Appstore" option, replacing "Find in Market". Added a new "Group by application" view. It's no longer necessary to manually keep ADB Debugging enabled. If signed with the system certificate, use Android's official APIs rather than root access. This won't be relevant for most users, but is useful when compiling a custom Android. Added new events from 2.3 and 3.0. Easier scrolling via a draggable thumb, as known from the Contacts app. Fixed "Application Info" option on Gingerbread. Use the new Honecomb-theme on 3.0 devices. Fixed: Occasionally, apps could not be disabled, and an "you might not have root" messages was accidentally shown (thanks to Dan Feigt). No longer ask for INTERNET permission. Re-release without Market copy protection. Retired our custom crash reporting in favor of Google's new built-in reporting facility (available starting with Froyo). Support installation on SD card. Added support for a number broadcasts new in Android 2.2. Fixed a stupid bug introduced in the last commit that broke orientation change and potentially caused crashes. Work around an Android bug that caused Autostarts to crash when processing certain packages that are advertised as being installed, but really are broken. Included higher resolution icons for HDPI screens, looks nicer now. Very slightly improved progressbar behavior during orientation change. Show a warning before disabling Google Talk with respect to Market downloads. Fixed display of component labels (a regression introduced in the 1.5.0 backend refactor). Improved way of using the root access; should work on more devices now, including the Archos devices and the Sholes Droid Mod. Major rewrite of how we retrieve package information. We no longer need to keep track of disabled components ourselves, and an uninstall of Autostarts no longer is an issue. The new backend also makes it possible for us to show additional events that are not in our database. Last but not least we can now show components that are disabled by default, and make a clean distinction between that initial state and changes by the user. Included pretty names and descriptions for a large number of new events. Added German translation (does not include event texts). Added support for two new events (SECRET_CODE, SPN_STRINGS_UPDATED). Improved handling of certain events (like PACKAGE_INSTALLED and friends) that previously didn't properly show up in many cases. There is still some work to do here. On first use and on the help screen we now show information about how to workaround the freeze bug in the Superuser Whitelist app. Support various new events introduced in 1.6 and 2.0. Fixed a pretty serious crash on almost every orientation change. Added option to only show disabled components. Warn the user more clearly about the dangers of uninstalling the app while components are still disabled. Minor architecture improvements under the hood, preparing for bigger things to come. Improved logging when an error occurs during component state change, to allow investigating problems. Fixed exception when trying to disable on some non-rooted devices. Fixed rare exception during system configuration change. Fixed apostrophe escaping in various texts, the help screen. Slightly improved some event descriptions. Remember state of "toggle system apps" filter across restarts. Allow root users to disable components (and enable them again). Added support for the PHONE_STATE action, which we previously missed. Menu option to reload the list. Menu option to expand or collapse all groups in one go.